Chelsea midfielder Cesc Fabregas will become a free agent next summer and has been linked with AC Milan, now he has dropped a hint over his future. The 31-year-old hasn’t featured as prominently as he would have liked so far this season, making just eight appearances in all competitions thus far. Following the arrivals of Jorginho and Mateo Kovacic this past summer, the Spanish stalwart has fallen down the pecking order under Maurizio Sarri, and unsurprisingly, that has led to question marks being raised over his future. 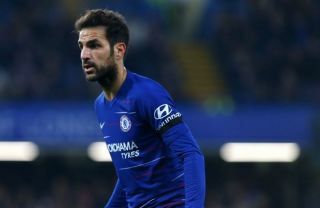 Further, given his current contract expires at the end of the season and with no renewal in sight, it does appear as though Fabregas is heading for the exit door and Milan have emerged as a potential option, as noted by The Sun. Now though, Fabregas himself has addressed the rumours, and although he has not confirmed his intention to leave or to specifically join the Rossoneri, he did drop a hint that he isn’t entirely happy with his situation at Chelsea but he doesn’t envisage a situation in which he leaves before the summer. “I’m at Stamford Bridge and I’m happy, but it’s clear that every player wants to play more,” he is quoted as saying by Calciomercato. Time will tell if Milan do step up their pursuit in January, as touted by the Sun, as Gennaro Gattuso has an injury crisis on his hands currently with both Lucas Biglia and Giacomo Bonaventura sidelined with long-term issues. Nevertheless, it also remains to be seen if Sarri is willing to lose quality depth with the Blues challenging on multiple fronts this season, and so a free transfer in the summer seems like the most likely outcome, but time will tell if Fabregas does indeed move on and accepts a move to the San Siro.